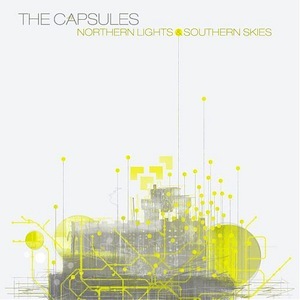 The Capsules’ fourth album soothes the ear with airy vocals and a mellow electronic sound. Husband and wife duo Julie and Jason Shields have been making music together since high school, in the band Shallow and now with The Capsules. Their music has been described as “atmospheric,” “swirling,” “ambient,” and their fourth album, Northern Lights & Southern Skies, is true to form. Guitars and keyboards take The Capsules’ sound from wistful on songs like “Across The Sky” to the melodramatic “Our Apocalypse.” Kevin Trevino completes the trio on drums with his low key rhythms, complementing the airy vocals and melodic bass of his bandmates. This time around, the band’s use of keyboards takes over the liberal use of guitar of their previous albums. The Capsules have had their music features in the popular video game “Borderlands 2” and even an episode of “Spongebob Squarepants.” It’s easy to hear how Julie’s pleasing shoegaze-y vocals would accompany game play or a catchy kid’s tune. We’re sure their variety of pleasing dream pop will be reaching across the country very soon.